Alderton D. "Ty i Twoje ptaki"
Alderton D. "Parrots, Lories and Cockatoos"
Allen G. R., C. Allen "Cockatiel Handbook"
Arndt T. "Lexicon of Parrots"
Artz V., Birmelin I. "Takie jak my? Czy zwierzęta mają swiadomość?" Attenborough D. "Prywatne życie ptaków"
Barber T. X. "The Human Nature of Birds"
Bartenschlager E. M. "Papugi i papużki"
Barrie A. "The Guide to Owning a Cockatiel"
Berra T. "A Natural History of Australia"
Berlin D. "Training Captive-Bred Parrots"
Bielfeld H. "Papugi i papużki"
Birkhead T. "Sekrety ptaków. fascynujący świat ptasich zmysłów"
Birmelin I., A. Wolter "Wellensittiche"
Boosey E. J. "Parrots, Cockatoos & Macaws"
Brehm "Tierleben" część VIII w tym "Papageien"
Burgmann P. M. "Feeding Your Pet Bird"
Cookie D. i F. "Keeping and Breeding Cockatiels"
Cross P., D. Andersen "Cockatiels and their mutations"
D'Arezzo C. S. "Parrot-Toys and Play Areas : How To Put Some Fun Into Your Parrot's Life"
Davids A. "Budgies. A Guide to Caring for your Parakeet"
Delphy K. "The Proper Care of Cockatiels"
Delphy K. "Loris, Fledermaus- und Sperlingspapageien"
Diamond J., A. Bond "Kea, Bird of Paradox"
"Die faszinierende Welt der Vogel"
Dost H. "Sittiche und andere Papageien"
Duhr D. "Notfallhilfe fur Papageien und Sittiche"
Forshaw J. "Parrots of the World"
Gage L. J., Duerr R. S. "Hand-Rearing Birds"
Gallerstein G. A. "The Complete Bird Owners Handbook"
Gould J. "Handbook to the Birds of Australia"
Grahl de, W. "Papageien. Lebensweise, Arten, Zucht"
Grindol D. "Cockatiel for Dummies"
Grindol D. "The Complete Book of Cockatiels"
Grindol D. Roundybush T. "Teaching Your Bird to Talk"
Gucwińscy H. i A. "Papugi czyli upierzone małpy"
Harper D. "Keeping Pet Birds. A Practical Encyclopedia"
Heidenreich B. "The Parrot Problem Solver"
Hennicke C. "Der Graupapagei in der Freiheit und in der Gefangenschaft"
Jabłoński K. M. "Rozelle i świergotki"
Jabłoński K. M. "Papugi kozie"
Juniper T., M. Parr "Parrots. A Guide to the Parrots of the World"
Karocka J. "Nimfy. O nimfach prawie wszystko... i o innych papugach co nieco"
Kavanau J. Lee "Lovebirds, Cockatiels, Budgerigars. Behavior and Evolution"
Kruszewicz A. G. "Hodowla ptaków ozdobnych. Gatunki, pielęgnacja, choroby"
Kunne H-J. "Die Ernahrung der Papageien und Sittiche"
Lachman L., D. Grindol, F. Kocher "Birds of the Perch. 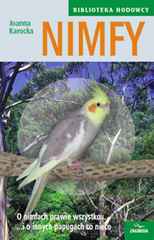 Therapy and Training for Your Pet Bird"
Lancert J. "Wielka księga ptaków ozdobnych"
Martin T. "Color Mutations & Genetics in Parrot"
McCluggage D., P. L. Higdon "Holistic Care For Birds"
McLelland "A Colour Atlas of Avian Anatomy"
Moon E. L. "Experiences with my Cockatiels"
Moustaki N. "Parrot for Dummies"
Moustaki N. "Why Do Cockatiels Do That? Real Answers to the Curious Things Cockatiels Do"
Moustaki N. "Your Outta Control Bird"
O'Neill A. "Jak opiekować się papugami"
Pees M. "Leitensymptome bei Papageien und Sittiche"
Pepperberg I. M. "The Alex Studies. Cognitive and Communicative Abilities of Grey Parrots"
Rach J. "Bird Care & Training"
Rach J. "Guide to Cockatiel"
Rach Manchini J. "Why Does My Bird Do That?" Radtke G. A. "Die Farbshlage des Nymphensittiches"
Reed N. A. "Cockatiels! Pets - Breeding - Showing"
Robar T., D. Grindol "Teaching Parrots with Positive Reinforcement"
Roundybush T. "Diet and Feeding"
Russ K. "Die sprechenden Papageien"
Schmidt J. "Mein Wellensittich zu Hause"
Schneider B. "Vogel im Hause"
Schone R., P. Arnold "Der Wellensittisch. Heimtier und Patient"
Selby P. J. "The Natural History of Parrots"
Smith G. A. "Encyclopedia of Cockatiels"
SparksJ. , T. Soper "Parrot, a Natural History"
Teitler R. "Taming and Training Cockatiels"
Toft C. "A Look at Cockatiel Genetics"
Verhoef-Verhallen E. J. J. "The Complete Encyclopedia of Cage & Aviary Birds"
Vriends M. M. "The Cockatiel Handbook"
Vriends M. M. "A Complete Guide to Aviaries"